18 February 2017 Gujarat, Surat: It is a matter of great pride and honor for the Skin specialist fraternity and community hailing from the state of Gujarat that Dr. Megha Shah famed for Beauty and Curves, laser cosmetic institute located at Surat who is also celebrated as the pioneer of painless beauty treatment in India has recently been nominated out of hundred shortlisted nominees for the award of Eminence and “Excellence in Skin Care”at a formal felicitation ceremony and programme held at the Grand Bhagwati Hotel in Surat, Gujarat. 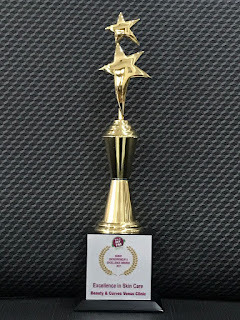 Dr. Megha Shah has achieved this award in a race of thirty five shortlisted eminent aestheticians and cosmetology experts out of hundred personalities in Gujarat’s skincare space. Dr. Megha Shah, Owner and Medical Director of Beauty & Curves Laser and Cosmetic Institute in Surat, Gujarat, lays her claim to fame by being distinguished as being the first in the cosmetology community to have introduced “Painless Beauty” in India. Dr.Megha Shah who has been practising Medical Aesthetics for over 20 years after having practiced cosmetic ophthalmology from Maharaja Sayajirao University of Baroda, pursued Masters in Medical Cosmetology from Texas University. She took up multiple fellowships for over 150 technologies, nationally as well as internationally with popular names in the aesthetic and cosmetology industry. Dr. Megha Shah has established new horizons in the field of non-invasive body sculpting and obesity management. She is also optimizing her professional skills by adopting and changing invasive cosmetic procedures to more acceptable non-invasive procedures. Upon conferred this honour, Dr. Joy Shah, Visionary Leader, Venus Clinics (Drjoy.in Consultant Pvt. Ltd) and Strategic Partner Venus Concept India comments, “At the heart of Venus Treatment Clinics, we aim to promote painless and comfortable treatments to the Indian Skincare market and landscape thanks to, Venus Concept’s devices Venus VivaTM,Venus FreezePlusTM, Venus LegacyTM and Venus VersaTM. Venus Treatments work by biological stimulation of natural healing process and neovascularization which makes the treatments very safe and user friendly. What is more, Venus Treatments are democratic and affordable to everyone”. Beauty & Curves Venus Treatment chain of clinics which is already a popular brand name in the city of Surat and Vapi, you will experience non-invasive, painless, quick, effective and affordable Venus treatments with committed results and high patient satisfaction scores. The clinic offers a full range of aesthetic medical services like laser hair reduction, hair stimulation, anti-aging, anti-cellulite, stretch mark reduction, acne scars and many more. Beauty & Curves is the only clinic for non-invasive treatment that has triple-action which repairs, prevents and maintains your skin.